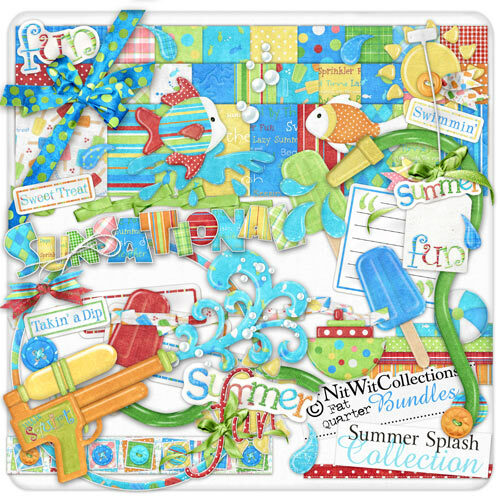 My "Summer Splash" Collection is yet another in this series! Pool parties are a summer must in this here household! Well, any water activity for that matter! Whether it's a water gun, a sprinkler, or the garden hose... it's all considered great entertainment by my little furry friends! So it was only a matter of time before I put together a HUGE collection of items so that I could capture all those moments for my memory books too! This STUFFED kit is full of all sorts of summery items... a sun, a pool (of course! ), a garden hose, plenty of popsicles (cause what would a pool party be without snacks? ), fishes, play toys, and even a super duper water gun! It's bound to be a real asset to help you create splashy layouts of all your pool parties, popsicle eatin', or even just running through the sprinkler photos! Hope you have as much fun creating as we do at our parties! As this is a HUMONGOUS kit please check the preview below for more of what is included in the dang thing!